Metabo HPT's first MultiVolt circular saw is well-built, lightweight for its class, and outperforms our corded worm drive. While there's a little hiccup on the secondary handle design, it's a premium saw that belongs in the conversation among the top players. Hitachi has completed their transition to Metabo HPT and one of the platforms they’re counting on to launch that new branding is the MultiVolt system. On the 36V side is the new Metabo HPT MultiVolt Circular Saw. I want to know if it fits in the ranks of the recent Cordless Supersaws. The Metabo HPT MultiVolt Circular Saw is going to be a fine addition in nearly every setting that requires a circular saw. You’ll get the most out of it if you’re looking to split time between cordless convenience and corded runtime. Before I dive in too far, let’s define the idea of a Cordless Supersaw. To earn that title, a cordless circular saw has to outperform our benchmark corded saw – the Skilsaw SPT77WM worm drive. It’s not an easy task and only a handful of cordless models have done it. For the entire MultiVolt line, one of the breakthrough features is the ability to run on a MultiVolt battery or use the AC adapter. It gives you cordless convenience when you want it and unlimited runtime when that’s your highest priority. The MultiVolt battery is also backwards compatible to any Metabo HPT or Hitachi 18V tools. The fact that the Metabo HPT MultiVolt Circular Saw has bevel stops isn’t big news – many saws do. But this one is a little unusual with a sort of zigzag pattern. You hit the 45º bevel stop, then have to slide up and over again to hit 55º. 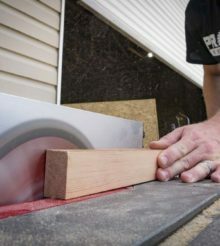 The PTR jury is still out on whether they love it or not, but there’s no question it makes stopping right at the common 45º bevel easier than other saws that go beyond that mark. In another unusual move, you get additional control over the LED light. You can cycle between constantly on, trigger-activated on, or off completely. The constant on mode is nice for helping line up your blade on the cutline before you start up the motor. The guard has a dust port attachment point, but you’ll have to buy the accessory separately if you want it. That’s hasn’t been unusual, though Milwaukee and Makita both included the adapter with their latest models. There’s also no hook to hang the saw. The Metabo HPT MultiVolt Circular Saw is a blade-right design and doesn’t stray far from a typical sidewinder design. The main handle features a push-in trigger safety and overmold that makes gives you a comfortable, secure grip. The only issue we have is that the secondary handle is too small to be comfortable. Adjusting both the depth and bevel locks is as easy as we can hope for and their full metal construction should keep it from being a major failure point. The saw weighs 7.5 pounds bare and 9.7 with the MultiVolt battery. That’s well under the loaded weight of a corded worm drive and its cordless counterparts from Makita and DeWalt. Compared to the sidewinder models, it’s more than a pound lighter than Makita’s XSH06 and more than 3 pounds lighter than Milwaukee’s new M18 Fuel. The Metabo HPT MultiVolt Circular Saw has two running modes – something we don’t normally see on other circular saws. Kicking down into Auto Mode (Silent Mode) slows the blade to 2000 RPM for a lower speed start to your cut and seems to hold it there well, even in 2x material. Using this mode extends your battery life and drops the noise level 10 decibels at startup. This mode is going to do its best work on thin sheet goods that don’t need a ton of power to cut. It doesn’t seem like there’s much difference between making cuts using the battery and the AC adapter. Just to make sure, I measured the no-load RPM of the blade and both are within a couple of RPM of each other. Ah, the beauty of electronic controls. The saw feels powerful for a cordless model. We set up our standard full-depth rip test and Metabo HPT does edge out our corded baseline model by almost 2 seconds. That’s good enough to make it into the Cordless Supersaw class. Against the other Supersaws, Metabo HPT isn’t quite as fast. Here’s how it breaks down. That still makes Metabo HPT the 5th fastest cordless circular saw we’ve ever tested. When it comes to tracking, I didn’t have any issues keeping it on a cutline or running it against a straightedge. I’d like to see Metabo HPT offer a track to go along with this saw similar to what Festool does with their HK series carpentry saws. It won’t give it the same design to replace a dedicated track saw, but it would add some versatility. Pricing is where the Metabo HPT MultiVolt Circular Saw moves away from what we’re used to seeing. As a bare tool, it’s going to run $359 and you’ll get to choose either an AC adapter or battery starter kit to go along with it – so it’s really a kit price. Either power option will be another $150 (or $99 for just the battery) if you want to add it so you have both. The best bang for your buck is to simply add the power source you want as you add Metabo HPT cordless tools. You also get a lifetime warranty on the tool. At the moment, Metabo HPT is running a promotion to give you an extra battery with your MultiVolt purchase – just register at www.metabohptfree.com and they’ll send it to you. Metabo HPT’s first MultiVolt circular saw is well-built, lightweight for its class, and outperforms our corded worm drive. While there’s a little hiccup on the secondary handle design, it’s a premium saw that belongs in the conversation among the top players.